Skin mole is a permanent or acquired dark spot on the skin. Usually it is part of skin pigmentation and appears on part of the body, where melanocytes form cluster formations. Most often moles are a benign growth of the color cells of the skin (melanocytes) and can even add some charm to the appearance of their owners. However, sometimes moles can cause a serious health risk. Another type of skin mole is the cellular. It is a raised hemispherical formation, which is soft to touch with smooth or with a furrow pattern. The color can be the same as the skin, grayish or dark purple. The size can vary from that of a lentil bean to a cherry. This type of mole usually appears on the face and torso. The blue nevus is a variant of a common mole. It appears mostly on the face in the shape of small lentil-like ganglions, which have a blue color and can be seen through the skin. The blue nevus is composed of melanocytes, the cells which produce the melanin pigment. This nevus gets its name from the distinct clinical appearance because of the pigmented cells within the dermis. It is benign and is usually more of a cosmetic problem. When does the skin mole pose a threat? 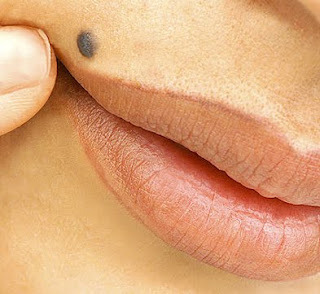 If a particular skin mole is causing you discomfort or you simply dislike it don’t hesitate to remove it. At the same time, emphasize the beauty marks you like by covering them with an eye pencil to make your individual beauty shine!